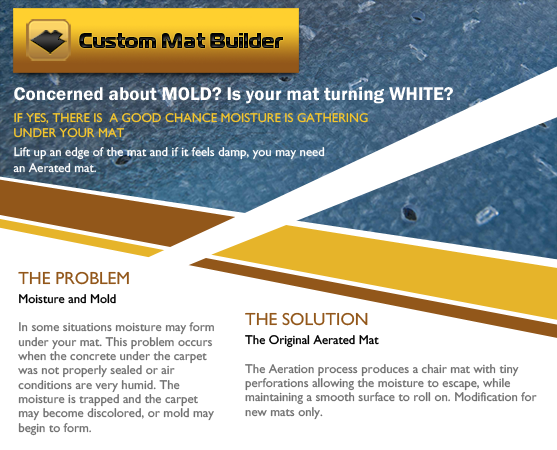 Need help choosing the right mat? Choose the overall material size. Select a shape and fill in the dimensions (opposite side totals must match). Choose any extras (Beveling, Aerating). Please note: Drawing does not have to be to exact scale. As long as the general shape and measurements are correct, we can make the mat. Anchorbar Premium .200" and Anchorbar Executive .250"
We warrant our vinyl chair mats to be free from defects in workmanship or material. 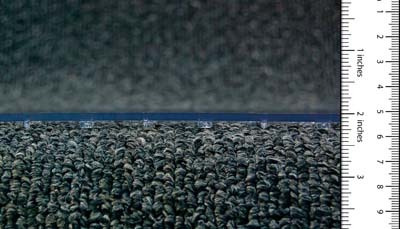 Should one of our (.200 thick +/-10%) Premium Anchorbar mats or (.250 thick +/-10%) Executive mats break or crack under normal usage, we will replace the chair mat once with a like or similar product (or, at our option refund the original purchase price) upon proof of purchase and upon return of a small piece of the defective mat to factory or a detailed picture with transportation charges prepaid by you to and from factory. (You will be responsible for the freight for the replacement mat under this warranty). Colors are subject to normal action of exposure and to sunlight and are therefore not covered by this warranty. The use of metal casters or casters with surface contact less than one-half inch in width or use on painted or varnished surfaces voids this warranty. We reserve the right to inspect the returned goods for evidence of misuse prior to issuing any adjustments. This warranty is in lieu of all other warranties, expressed or implied, including any implied warranties of merchantability of fitness, which are expressly excluded. Liability under this warranty is limited to cost of the product and shall not extend to any other special or consequential damages. 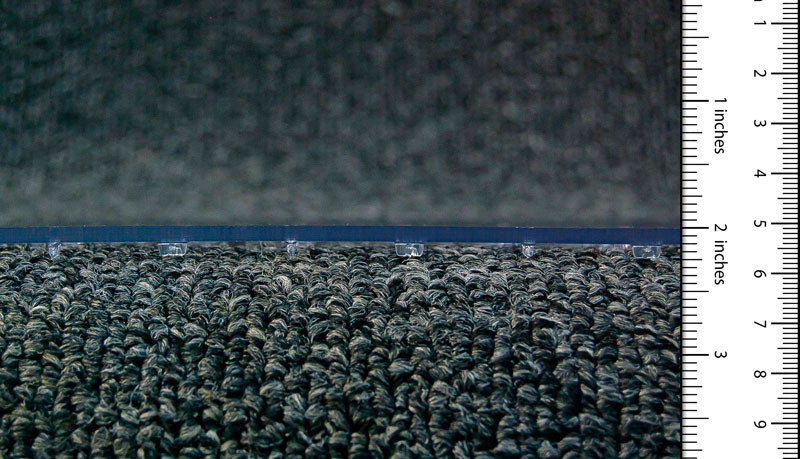 Please Note: Mats that have been converted to an Aerated Mat or a Link Mat are not covered under this or any warranty. 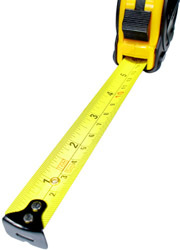 The price of your mat is determined by the overall sheet size of the material needed. Enter the total size of your mat including any lips/extensions and click the apply button. Example: Your mat is overall 33 x 47, the price is based on a 36 x 48 sheet. 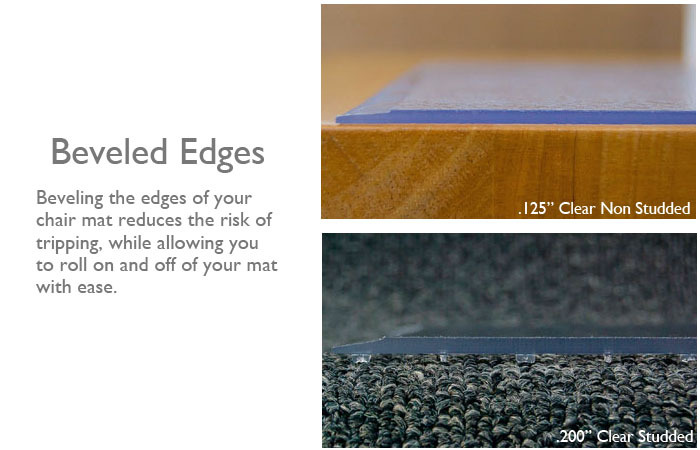 There is no extra charge for cutting your mat to the specified shape. Enter your actual mat size and click "Apply"
Visit our Chair Mat Measuring Tools page to see how-to videos, download printable patterns, and get tips on measuring your perfect chair mat. *Please double check your order before submitting, custom shapes and sizes are NOT returnable. Helps prevent tripping in high traffic areas. Helps with mold and mildew problems. * If you're using Internet Explorer and the image doesn't show up, please try using any other browser. Certain versions of IE have trouble displaying the generated image correctly.